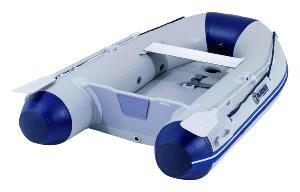 The Talamex Slatted Floor inflatable boat is manufactured to very high specifications. Made from extremely high quality, durable 1100gsm weight pvc cloth, it has 3 inflation chambers, an over –pressure valve, 3 solid carrying handles, hard sponson ends for rack storage, stainless steel towing eyes and comes in an "open plan” bag. Also includes a pump, repair kit and oars. Perfect for use as a tender or for river,lake or canal exploration. 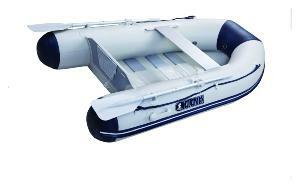 The Talamex Air Floor inflatable boat is manufactured to the same high specifications as the slatted floor dinghy. The inflatable keel gives the hull a V shape which enables it to plane easily and cuts down on windage. Made from extremely high quality, durable 1100gsm weight pvc cloth, it has 3 inflation chambers, an over –pressure valve, 3 solid carrying handles, hard sponson ends for rack storage, stainless steel towing eyes and comes in an "open plan” bag. Also includes a pump, repair kit and oars. The air floor and inflatable keel give it added stability.